Valentine’s Day and chocolate just go together! Can you really have one without the other? I crave chocolate all year round and with some of the recent research I have read, I can feel all right about giving in. A recent study reported in the American Journal of Clinical Nutrition tested the effects of dark and white chocolate on healthy adults to determine whether either type played a role in blood pressure and insulin sensitivity. 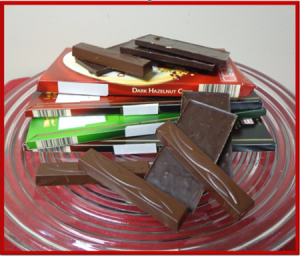 They concluded that dark chocolate can indeed help reduce blood pressure and insulin resistance. White chocolate did not provide these health benefits. Keep in mind that although dark chocolate has health benefits, most chocolate bars are high in saturated fat, so moderation is key. Eating dark chocolate cannot substitute for everyday healthy food choices. Nor can chocolate replace regular exercise or medications that have been prescribed by your physician. It is so nice to know you can indulge in your Valentine’s Day chocolate, in moderation, without feeling guilty about it if you choose the dark. Shelley is the FCS/EFNEP Agent in Wakulla County.She joined the UF/IFAS Wakulla County staff in 2008 after re-locating in Florida.She previously worked for the Kansas State University's Extension Service for 13 years in a county position.She also spent 15 years in various administrative roles in the Kansas community college system.She owned and operated an interior business for five years.